Blackstone Minerals (ASX:BSX) has provided a promising update from its high grade Little Gem Cobalt-Gold Project in British Columbia, Canada. The company re-commenced its maiden drilling program at Little Gem in late April, with drilling to date intersecting the structure just metres within the interpreted target. BSX believes the Little Gem alteration halo is larger than previously estimated, with the 2018 drilling to date having consistently intersected a broad alteration zone and highlighting the potential for a significant hydrothermal system on site. Assay results are expected shortly for the next three holes from the maiden drilling program. 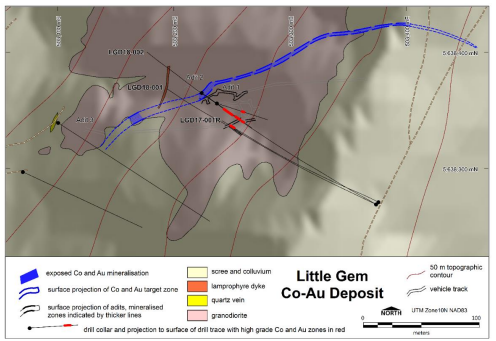 The company has started a geophysical survey to test for further high grade cobalt-gold prospects within the recently identified 1.8km+ strike target zone at Little Gem and nearby Jewel prospect. The Jewel prospect is located 1.1km north-northeast of Little Gem and is situated near the (serpentinite/granodiorite) contact zone. The site is prospective for cobalt-gold mineralisation comparable to the world class Bou-Azzer primary cobalt district in Morocco. BSX Managing Director Scott Williamson commented on the results, “Results from the first three drill holes have confirmed Little Gem has some of the world’s highest grade cobalt-gold mineralisation. 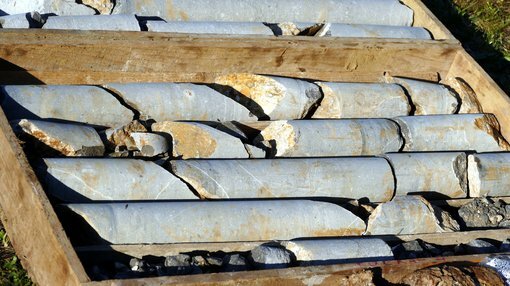 “We are looking forward to the next round of assays and results from the geophysical surveys to define the full potential of the mineralised system and the extensive alteration zone discovered at Little Gem,” he said. The Little Gem Cobalt-Gold Project was discovered by prospectors in the 1930’s, who identified a pink cobalt-bloom on weather mineralisation. This discovery led to three adits being developed at the site, with a total of 1,268m of drilling being completed as a result. Exploration has seldom occurred at Little Gem in modern times, with the main activities being airborne geological surveys in the 1970’s and a further two drill holes completed in 1986. The second mineral occurrence at the Little Gem site is the historic Jewel Gold Prospect, which supported gold production from 1938 to 1940. Since BSX began working on the Little Gem Project, it has verified the mineralisation identified historically. Cobalt contributes up to 60% of the total value of lithium ion batteries, which in turn is responsible for more than 50% of global cobalt demand. The lithium ion battery is projected to become the world’s most significant resource of power, with the adoption of electric vehicles being the key driver. Bloomberg has forecast that 55% of vehicles sold by 2040 will be electric. Cobalt is projected to have a significant supply shortage, as current mining activity is only just meeting demand. Cobalt prices have risen from US$10/lb to US$40/lb over the past two years.